At 24:56, Vai shows his personal pedalboard, which has the chorus in his effects loop, after a volume pedal. He does this, as it splits the signal into stereo, going into two Boss DD7 delays and two different heads. "The Chorus pedal I use just a little bit in 'Crystal Planet' and a little bit in 'Wind in the Trees'." The Boss Super Chorus CH-1 can be seen in Jerry Cantrell’s pedalboard at (5:32) in this premier guitar Rig Rundown. [This](http://www.guitargeek.com/zakk-wylde-ozzy-osbourne-1988-guitar-rig-and-gear-setup-diagram/) detailed gear diagram of Zakk Wylde's 1988 Ozzy Osbourne stage setup includes a Boss CH-1 SUPER Chorus pedal. Nugent’s pedal board has a Boss Super Chorus, spotted in this Premier Guitar video at (16:18). A detailed gear diagram of Dave Navarro of [Jane's Addiction](http://equipboard.com/band/jane-s-addiction), shows the stage setup that traces the signal flow of the equipment, showing a Boss CH-1 SUPER Chorus Pedal. 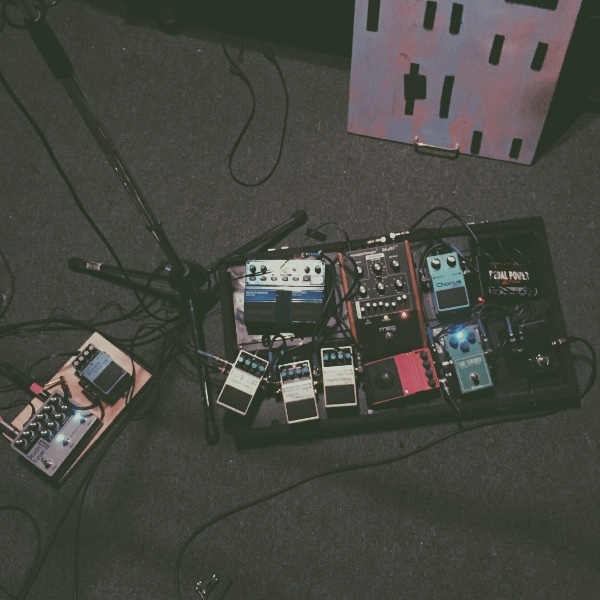 Ryan posted a picture of his pedal board on Instagram on Jan 2, 2015 with a Boss CH-1 SUPER Chorus Pedal on the top right of the board as pictured. This detailed gear diagram of Andreas Kisser's Sepultura stage setup, found on [Guitar Geek](http://www.guitargeek.com/andreas-kisser-sepultura-guitar-rig-and-gear-setup-2006/) shows that Andreas uses a Boss CH-1 SUPER Chorus pedal. This is a photo of the Pantera, Kill Devil Hill, and Down's bass player Rex Brown's pedal board. You will notice just below the board is the setlist for the evening which shows "Devil Hill Music.com" over it's top. On the far right bottom of Brown's pedal board is a BOSS Super Chorus CH-1. You can tell its a CH-1 and not one of the other models by the pattern of lettering. According to the Tone Freak website, Toro uses the Boss CH-1 SUPER Chrous pedal. Here (https://www.youtube.com/watch?v=fRhApUF-Q8g) at 2:15 we can see the super chorus when Mikey play with the slicer. Used for the main riff in "Motorycle Emptiness" along with "a Marshall Shredder pedal". According to the Reverb's website, Felder's pedalboard for "Hell Freezes Over" also included the Boss CH-1 super chorus pedal. According to Reverb's website, Frey's pedalboard for the "Hell Freezes Over" tour also included the Boss CH-1 chorus pedal. In this photo, which shows Jeff Waters with his rig, we can see the Boss CH-1 SUPER Chorus pedal. In this photo, which shows Howe's effects, one of the pedals that can be seen is the Boss CH-1 chorus pedal. Mr. Vincent Accardi uses the Boss CH-1 SUPER Chorus Pedal on his pedalboard. Seen at 7:00 in his Rig Rundown. You can see the pedalboard photo in the article. Premier Guitar Rig Rundown uploaded March 18th 2016. Alexi says he keeps it on all the time. Here you can see Steele's pedalboard with the Boss CH-1. You can see a picture of Peter with his board [here](https://41.media.tumblr.com/tumblr_m7mbh6gFuw1rp1ip8o1_1280.jpg), where the pedal layout matches the closeup view by color. The CH-1 blue is seen closer to Peter. “I have a Planet Waves tuner, a Morley A/B box, a Zoom 9000, a Boss Blues Driver, a Fulltone OCD box, a TS-9 Tube Screamer, a Boss Chorus and a Line 6 delay.” In the article photo, the Boss CH-1 Super CHORUS is visible, however. CH-1 seen at far right bottom of Dave's board. 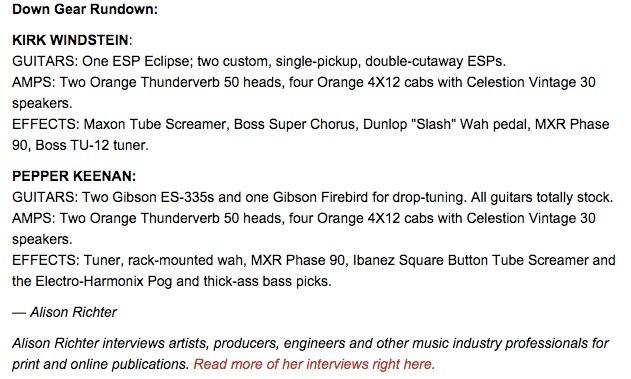 According to guitar.com's 2011 rig diagram, Berman uses the Boss CH-1 Super Chorus pedal. In this Facebook post, John Nolan shares a photo of the pedal board he is using to record Taking Back Sunday's new album. According to Premier Guitar, Roland also posseses this pedal. He uses Boss Super Chorus. In Greenway's pedalboard shots, Boss CH-1 Super Chorus pedal is visible. "We jumped back to the rhythm track and did the Les Paul again to make it perfect now that the bass and ESP tele were done right. We had a picking part to capture which we used some old Ibanez Phase pedal and a BOSS CH-1. Good tone from that combination." According to Premier Guitar's rig diagram, Roth uses the Boss CH-1 chorus pedal. According to his official website, a CH-1 Super Chorus is one of his pedals. According to Guitar Geek's 1996 rig diagram, Smith used the Boss CH-1 super chorus pedal. The Chrous, Super Flanger, and Bass Overdrive pedals are mostly used for noise and interludes during Full Of Hell's live sets. The super chorus has been used on “Pisces Legs” on ‘Roots of Earth’. These pedals were all also used on the Merzbow collab in non-conventional ways. I had the flanger and super chorus running through a contact mic, which I then taped it to a cymbal for one track and to a floor tom for another. As seen on the artists Instagram account. 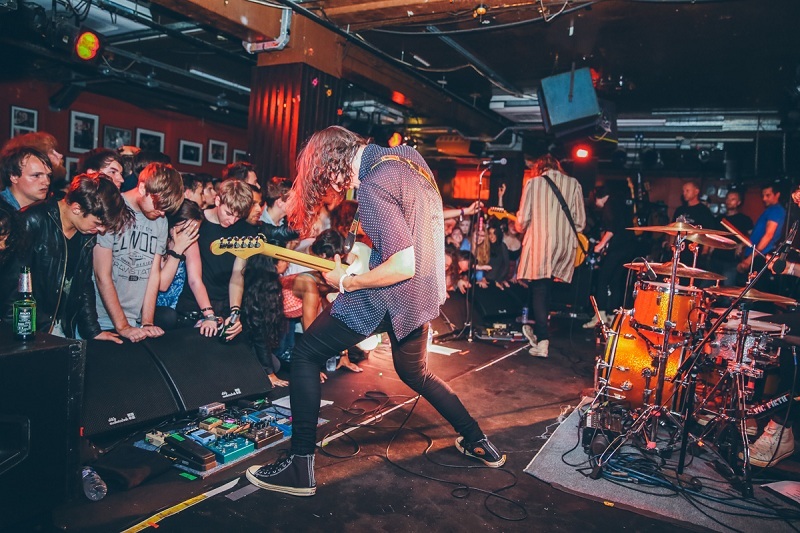 [This article](http://www.premierguitar.com/articles/22424-courtney-barnett-the-new-sensation?page=2) lists a Boss CH-1 among Courtney Barnett's gear. "EFFECTS: Maxon Tube Screamer, Boss Super Chorus…" - [*Guitar World*](http://www.guitarworld.com/interview-getting-down-pepper-keenan-and-kirk-windstein#slide-0). In this photo of Payseur's pedal board you can see the Boss CH-1 SUPER Chorus. Rob shows off one of his pedalbaords in this image and we can see a Boss CH-1 SUPER Chorus Pedal. "10th June 2013 at Red Lion, Isleworth, Middlesex (gig with Derek Nash). The photo shows (left to right) a Marshall Bluesbreaker (which emulates the sound of the combo amplifier of the same name), a DigiTech EX-7 Expression Factory, Line 6 DL-4 Delay Modeler Pedal, an Ernie Ball VP JR (volume pedal), TC Electronic PolyTune (tuner) and a Boss CH-1 Super Chorus (makes sounds of similar timbre and pitch converge as one)"
In this photo of Pierce playing with Walter TV, a Boss CH-1 can be seen at his feet. I’ve played a whole bunch of pedals over the years. One of my favorite BOSS pedals is the BOSS Chorus, the light-blue-colored CH-1. When I first heard it, I went, “Wow. How could anyone play guitar without a chorus on it?” It’s just a beautiful sound. The pedal is placed on Becky's pedalboard and though it is mostly covered in tape the font, color, shpae, and look is that of Boss Pedals. 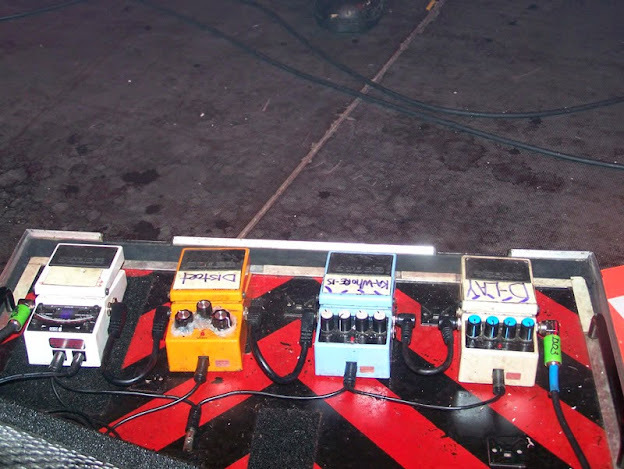 This picture of Jake's pedals shows a Boss Super Chorus. He no longer uses this pedal as it was not on his board when he did an interview in April of 2016 about his gear as of then. The pedal is shown on his pedalboard at 1:39. 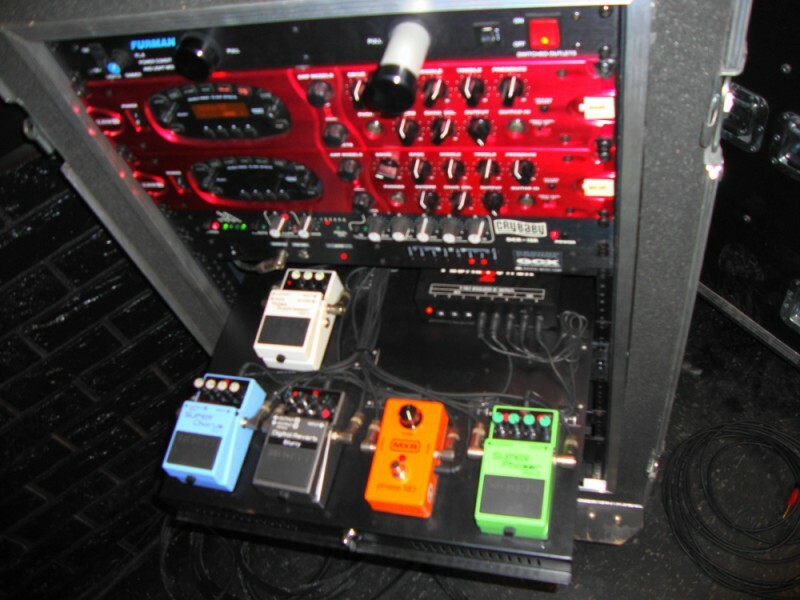 Jason uses an old-school Boss Super Chorus pedal on his electric guitar pedalboard. From Pinterest; this diagram is right, as I remember an interview with Lush from about 1991 in Making Music magazine where both Miki and Emma said they used BOSS pedals. 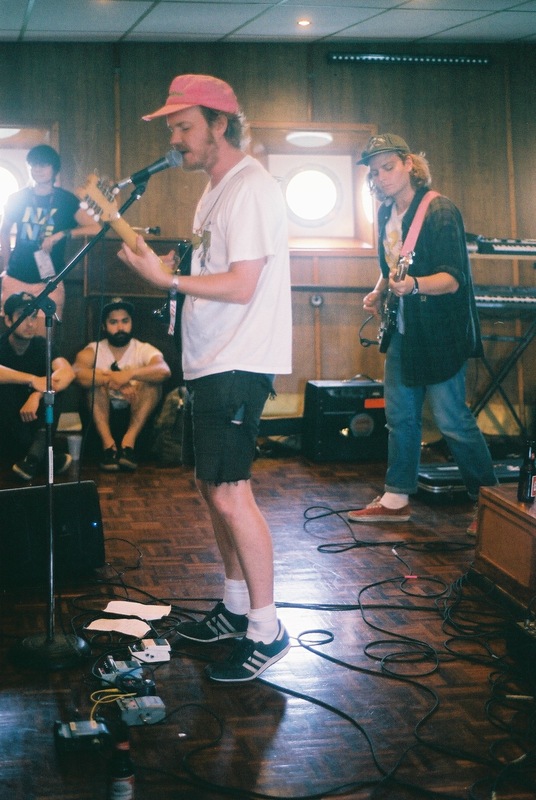 According to Premier Guitar's Rig Rundown with Citizen, Nick uses a BOSS CH-1. In [this video by EBnet](https://youtu.be/hMro0nBB4j0), the opening sequence shows Vasquez setting up his gear for a live performance. 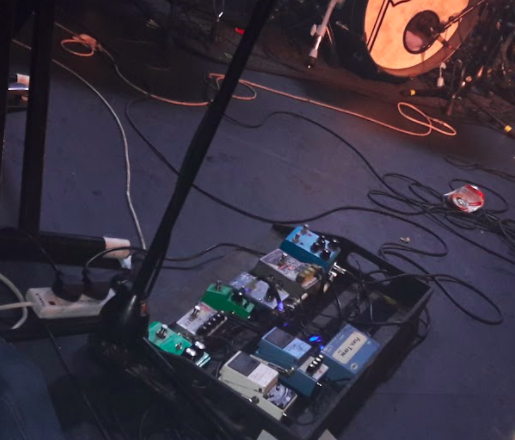 At the 9 second mark, there's a quick shot of his pedalboard, and the CH-1 can be seen on the top right. seen throughout the milkrun set, though as the video's fuzzy I'm goin completely off color here. assumed it'd be this one, so - could be wrong. [This image from a GoFundMe campaign](https://2dbdd5116ffa30a49aa8-c03f075f8191fb4e60e74b907071aee8.ssl.cf1.rackcdn.com/5971043_1441933712.8139_funddescription.jpg) posted circa 2015 after DM's gear was stolen shows a CH-1 on the small effects board on the left. "I used this for a number of years, and offered a fantastic watery sound. Used for all the clean parts on Void". It's a nice, smooth chorus sound, even at the most extreme setting. FANTASTIC for clean stuff or a Rush-esque overdrive sound. What it does, it does well but I don't find it too versatile. I find it hard to get different styles of effect out of it. If your after a good sounding more subtle chorus for mostly overdrive tones then this is a good choice but if you're after something like a deep 80s sounding clean tone chorus then id say theres probably better options out there. I will say its lasted me countless gigs and in typical boss fashion it can really take a beating. This Super Chorus effect is not called Super unreasonably. Its really one of the best Chorus effects what I´ve ever seen. Its very interesting that this wonderful effect costs just something around 100 dollars. This fact I find very important and nice. I use this effect in my pedalboard and I am really satisfied. Overall it's quite cool but it's not one thse pedals you would use in every song. It gives a really really cool sound, and it's boss built, so it will surely live longer than me. The pedal has a wide variety of intensity of effects and doesn't mud up the tone of the guitar. I LOVE THIS PEDAL. I really like the chorusy sound of the 70s/80s and this was the first pedal I ever brought. It gives you that warm sound that you want in a chorus and the perfect melodic sound. I play it all the time when I can but need to buy a new adaptor for it. $399 in my country for a Waza craft CE-1W, I'd just pick one of these for $169. So, I really dig the clean, stereo-panning chorus sound a lot. I find that this one has a great deal of flexibility and range, with a wide array of cool sounds to play with, as long as you're looking for chorus. Simple, solid and SUPER ! Sounds fantastic with clean and distortion, a standard for effects lovers everywhere. Use it to boost my jp08, definetely adds the thickness i felt i was missing in my pads and basses. A very solid chorus pedal but having hear chorus effects like the original juno 60 its hard to call it great, it does its job well. Run it on wet for wet sound, it's great. CH-1 - safe chorus bet. I've been through CE-2, CE-3, CE-5, Small Clone and some other well known choruses and guess what - eventually ended up with CH-1 (not analog, digital one from 2015). It is versatile, decent sounding and very user-friendly pedal. Also price is very reasonable - got it brand new for about 70$ with 5 yrs of warranty. If you want a safe and good chorus then go for CH-1, definately. EDIT: After some time I got an analog version from 1996. Best one, ever! Overall a very good pedal that provides you basically everything you need from a Chorus Pedal. Boss is a great brand and CH-1 is as good as it can be. I found this gem at a pawn shop for $20. I was reluctant to buy it because it was made in Taiwan but I'm glad I bought it. When I turn the settings all the way up and play "Come As You Are" it sounds perfect. Like playing the guitar under water. Awesome! For the money, I feel this is one of the best values on the market is a chorus pedal that does everything you might expect it to- ranging from basic, subtle ambiance all the way to near-organ tremelo (especially if played with a baritone guitar). My favorite chorus pedal on my pedalboard! I don't have anything particularly good or bad to say. I use it very sparingly. Mostly just to add a little movement and thickness. For the beautiful and clean sounds of the music industry.